At a recent reception celebrating “National Pro-Bono Week”, Prisoners’ Legal Services of New York (“PLS”) presented me with its Paul J. Curran Award for Pro Bono Service by a Solo Practitioner or Small Firm for my work in securing the release of an elderly inmate on “medical parole”. The Curran award is named for Paul J. Curran, a longtime Chairman of PLS’ Board of Directors and a prominent public figure as a state Assemblyman, Chair of New York City’s Commission on Investigation and US Attorney for the Southern District of New York. 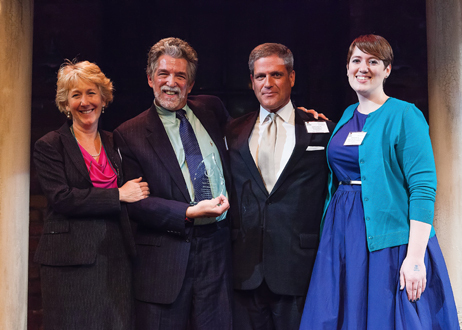 The award is presented annually to the PLS volunteer attorney who most embodies the late Mr. Curran’s commitment to protecting and defending the rights of incarcerated New Yorkers by providing pro bono services. “Pro bono” is a Latin phrase for professional work undertaken voluntarily and without payment or at a reduced fee as a public service. It is common in the legal profession and unlike volunteerism, uses the specific skills of professionals to provide services to those who are unable to afford them. I was presented with the award by Thomas Curran, Paul Curran’s son and a member of the PLS Board, in recognition of my work representing an elderly inmate in State Supreme Court challenging the state Board of Parole’s denial of the inmate’s application for medical parole. Following the Supreme Court’s affirmance of the Parole Board’s decision, I continued to work on an administrative appeal of a subsequent parole denial as well as Freedom of Information Law requests and advocacy efforts with the state Department of Corrections and Community Supervision. This past summer, after a year and a half of effort, I was successful in securing his client’s release. National Pro Bono Week is an annual celebration of pro bono programs where the sponsoring organizations can honor their volunteers, engage in community awareness and recruit attorneys to aid in their efforts. PLS, founded in 1976 and in response to the 1971 Attica prison uprising, provides high quality, effective legal representation and assistance to indigent prisoners incarcerated in New York State on issues associated with their conditions of confinement. It has four regional offices located in Albany, Buffalo, Plattsburgh and Ithaca, with a staff of twenty-three (23).